I used to have a slight problem with Hollywood musicals. Unlike Bollywood, where song-and-dance routines are set-pieces (specially designed and, most times, inserted as a side show with no real thread, unless they are playing in the background), American films which claim to be musicals have actors suddenly breaking into a song, impromptu, in an otherwise perfectly “regular” sequence.There’s something a little off. I couldn’t get over how silly Ryan Gosling and Emma Stone looked when they sang about their trials and tribulations in La La Land… that really destroyed the movie (yeah, it’s weird how I’d have no problems if Shah Rukh Khan serenades Katrina Kaif, but somehow, in my mind, that’s par for the course). Or how the potentially-brilliant Nine fell by the wayside because everyone in the ensemble cast was too busy with music and lyrics instead of slathering on the intrigue. Having said that, some of my favourite films —The Sound of Music, My Fair Lady, Annie, Can-Can, Singin’ In The Rain and so on — have been musicals; but even with them, it required a certain getting used to-ness. Baz Luhrmann’s Moulin Rouge was one exception: it didn’t take any getting used to — simply because it was conceptualised (and engineered) as a tribute to Bollywood. On the converse side, when a Bollywood film attempted to do an improvised Hollywood-style song in Padmaavat (Arijit Singh’s wonderfully rendered Binte dil picturised on Jim Sarbh singing to Ravneer Singh), I burst out laughing in the hall. Bottom line: I didn’t get too excited about American musicals… until a few weeks ago. A friend told me she’d watched the ABBA-inspired jukebox musical Mama Mia! Here We Go Again, and loved it. Would I be interested to watch it? In which case, she added, she’d like to accompany me and watch it once more. I agreed, chiefly because I hadn’t watched a movie with her in a long time, and since she’s quite the buff, I enjoy our theatre experiences. 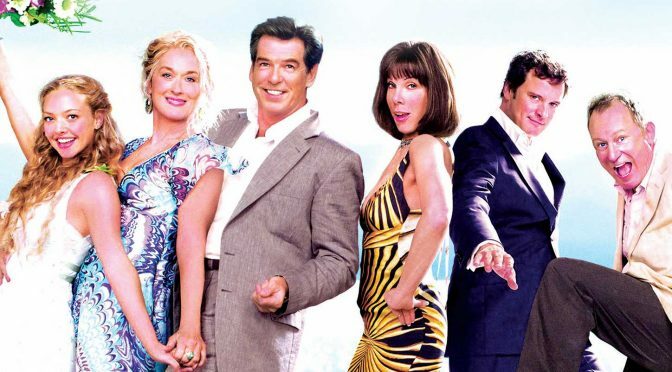 Besides, I’d watched the first part, Mama Mia!, on a flight, in a slightly distracted state, and had loved the soundtrack (whatever I could make out in an air-pressured cabin). Didn’t think much of the movie — but, then again, like I said, I was distracted. I’m generally quite old school, and don’t care about acoustics: if the movie in question doesn’t have a hi-fidelity, boom box-type sound system, I’m alright — as long as the audio is fairly clear. But in this case, it greatly helped that the sound was so tech-enhanced. The music sounded nonpareil. Mama Mia! Here We Go Again belted out close to 20 ABBA songs, including the likes of Knowing You Knowing Me, One Of Us, Dancing Queen, Mama Mia (but of course! ), Angel Eyes etc. Everyone in the audience was singing and clapping along, and even though the movie itself was turning out to be rather silly with no nodding acquaintance to basic logic, I felt I was part of a joyride. And I was loving the fact that I was doing exactly what I don’t like about Hollywood musicals: being spontaneous with the singing. My friend looked at me admiringly and said, “Wow, you’re a total ABBA fan, aren’t you? I’d never heard this one!” I told her how ABBA — not the Beatles or the Bee Gees or the Stones — was the first “band” I had gotten hooked on to as a kid, so I know all their lyrics “by heart”. Towards the end, when Cher (the heroine’s grandmother) bursts into Fernando upon seeing Andy Garcia, a lot of people in the theatre — including us — were on their feet, and singing along. “There was something in the air that night/ The stars were bright, Fernando/ They were shining there for you and me…” had never rung truer. Post-movie, with Andante Andante and When I Kissed The Teacher still swirling in our heads, and in between humming Fernando, my friend and I, while walking towards the taxi stand, talked about how ABBA was/is perhaps the greatest music band ever — because you don’t have to be a purist, a snob, a connoisseur, a pretender to love them. There’s no arrogance in loving ABBA — you love them because of the music. Simple. I’ve now discovered yet another reason for loving ABBA. It elevates ho-hum to greatness. Mama Mia! Here We Go Again was proof. I’ll probably give the movie an encore. To sing along. And also tell ABBA thank you for the music — for making me, belatedly, fall in love with Hollywood musicals. Previous PostMillennials are now driving a boom in re-sale clothingNext PostHow many Filipino phrases do you know, anyway?